Krumhardt, K.M., Lovenduski, N.S., Freeman, N.M. and Bates, N.R. 2016. 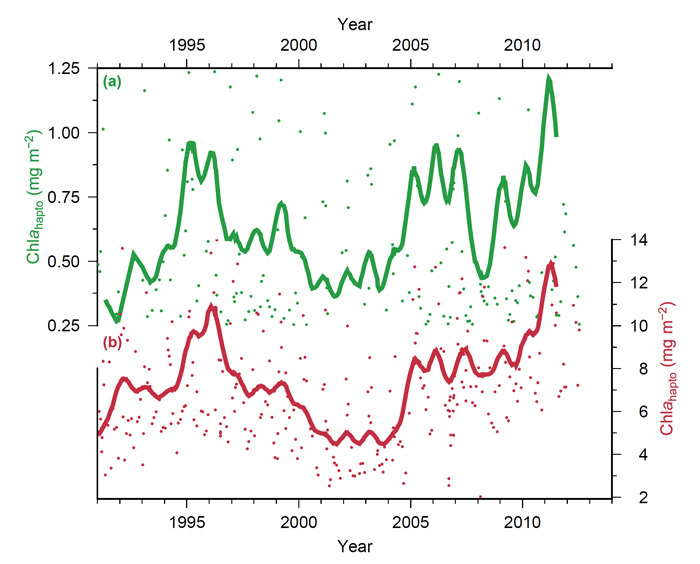 Apparent increase in coccolithophore abundance in the subtropical North Atlantic from 1990 to 2014. Biogeosciences 13: 1163-1177. Coccolithophores are calcifying phytoplankton that comprise the base of marine food webs all across the world ocean. They play an important role in the cycling of carbon into the deep ocean and act as a feedback to climate change. Anything that alters their function or abundance, therefore, could have significant impacts on marine ecosystems and global climate. Thus, it is no surprise that scientists are interested in how coccolithophores will respond to future changes in atmospheric CO2 and climate. And in this regard, Krumhardt et al. (2016) say there has been "much speculation [that has] inspired numerous laboratory and mesocosm experiments, but how they are currently responding in situ is less well documented." Working to provide just such an in situ analysis, the team of four researchers thus set out to analyze coccolithophore abundance in the subtropical North Atlantic over the period 1990 to 2014. To accomplish their objective, Krumhardt et al. used coccolithophore pigment data collected at the Bermuda Atlantic Time-series Study (BATS) site (located at 31.7°N, 64.2°W in the Sargasso Sea) in conjunction with satellite estimates of surface chlorophyll and particulate inorganic carbon as a proxy measure of coccolithophore abundance. Results of their analysis revealed that "coccolithophore populations in the North Atlantic subtropical gyre have been increasing significantly over the past two decades. More specifically, they note there was a 37 percent increase in euphotic zone-integrated (integrated from 140 m depth) in coccolithophore pigment abundance at BATS and a larger 68 percent increase in the upper 30 m of the water column (see figure below). Such findings, in the words of the authors, add to those of a growing number of studies showing that coccolithophores in the North Atlantic "are increasing in abundance and are likely stimulated by additional carbon from anthropogenic sources." The significance of Krumhardt et al. 's work is two-fold. First, they note that the increased coccolithophore abundance they found "is contrary to what numerous laboratory studies have predicted, highlighting the importance of in situ observations," which observations clearly show that coccolithophores benefit from higher levels of atmospheric CO2. Second, for those who are concerned about the potential climatic impacts of CO2-induced global warming, the increase in coccolithophore abundance is providing a natural brake on increasing levels of atmospheric CO2, as more carbon is exported to the deep ocean with their increased abundance. What is more, Krumhardt et al. note that in addition to transporting more carbon into the deep ocean, coccolithophores produce dimethyl sulfide, a marine trace gas that affects cloud formation and acts as a negative feedback to climate warming (see Dimethyl Sulfide in our Subject Index). Thus, it is that the four researchers conclude that overall increases in coccolithophore abundance will likely induce "a multitude of effects on marine ecosystems in the North Atlantic, as well as global carbon cycling and climate," all of which impacts, we note, appear to be for the better. Figure 1. Chlorophyll a (Chlahapto) from haptophytes (planktonic group to which coccolithophores belong) measured at BATS integrated from 30m (panel a) and 140m depth (panel b). Adapted from Krumhardt et al. (2016).